Why should we study biodiversity and systematics? In this programme, students are trained to gain the systematic and taxonomic expertise needed in our society to be able to take action against loss of biodiversity. NABiS is directed to students who are interested in a career as a nature conservation manager (public administrator or private consultant), officer at government agencies (Environmental Protection Agency, Swedish biodiversity Centre etc.) or non-governmental organizations (World Wildlife Foundation, Nature Conservation Organizations etc. ), manager of biodiversity infrastructures (GBIF etc.) or want to pursue an academic career as a museum curator or university researcher. NABiS was established in 2012 and since then, about 25-30 students have graduated with a master’s degree. A little under 10 students are admitted annually but there is room for expansion. I am enrolled at the NABiS program at Uppsala University. 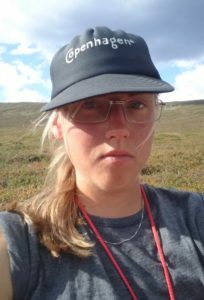 I took a Bachelor of Science in Biology at Stockholm University spring 2018, and then I joined the NABiS program in the autumn. My favourite groups of organisms are plants and birds, and I am particularly fond of grasses and sedges. I have taken several floristics courses and also plant systematics, and since I am both a plant nerd and a phylogeny nerd, I guess I am aiming at a career as a plant systematist. I simply love plant systematics. And that’s also why I joined the NABiS program. I am both interested in knowing the species around me as well as in systematic theory, so the mix of identification courses and systematic theory courses on the program was very appealing. Evolutionary theory is what always has fascinated me most in the field of biology. I think systematics and phylogenetics is very important, and when I learn a new species, I always want to know its place in the tree of life as well as just recognizing it. On Facebook there is a group where students and teachers can share information. It is not at all mandatory to join the group but will hopefully be beneficial for those who do. The group is simply called NABiS and can be found here or through a Facebook search. However, it should be noted that this website is the students’ main source for information and students shouldn’t go amiss though they don’t join the Facebook group.